The French language has no adjective for 'nonsensical'. The closest is insensé. The trouble is that it means not nonsensical but demented – 'out of his senses'. This points to a deep-seated relationship between nonsense and madness, which the Cheshire Cat acknowledges when he says to Alice: 'we're all mad here'. The characters of nonsense indeed tend to be delirious – they go from eccentricity to raving madness. It is natural, therefore, that the game should inscribe the discourse of madness. But the game itself, in spite of its name, is not mad. Its constitutive strategy is one of last-ditch defense against the contagion of madness, in so far as it is the locus for an incipient, or inchoate, reflection on the language and behavior of mad people, (Jean-Jacques Lecercle, Philosophy of Nonsense, p. 204). Artaud pushes nonsense to the point where it is no longer a matter of the individual being able to assign personal meaning to a word, á la Humpty Dumpty; instead, language becomes an incomprehensible glossolalia raising questions about what it even means to say that an “individual” speaks, or that inter-subjective “communication” takes place. In other words, while Humpty Dumpty may idiosyncratically define the word “glory” as "a nice knock-down argument," he still manages to actually have a nice knock-down argument with Alice. Artaud on the other hand interfaces with no-one. He may think his language is universal, but in fact it is utterly idiosyncratic, and therefore, utterly private. Between these two, between that Non-Sense which ultimately sides with the linguistic order of society and conventional speech, and the madman's scream lie the fous, whose work falls at neither end of the order-disorder continuum, but always manifests the difficult struggle between them. In up coming posts we shall examine the work of the most famous fous, Louis Wolfson, Jean-Pierre Brisset and Daniel Paul Schreber. Before doing so however, a brief digression on the tradition of fous-studies is in order. As stated previously, serious engagement by philosophers and linguists with fous writing is very recent, beginning in the 1960s when their work was discovered by a generation of scholars reading the critical works of Kristeva, Foucault and Deleuze, each of whom were already exhibiting disaffection with the reigning (linguistic) orthodoxy of Structuralism. Foucault wrote on Roussel and Brisset, Kristeva on Roussel, and Deleuze on Wolfson, and there are cross-references between them. This disaffection lead each critic to turn to marginal works of literature as a resource through which they might renovate speculations on the nature of language. In other words, the fous acquired critical significance, not because they transformed literary studies, though it may be hoped that this too will eventually happen, but because they were a resource philosophers could use for transforming an ossifying linguistics. As linguistics was, in the mid-twentieth century, the paradigm for structure in many other fields, its renovation was a not insignificant task. I would argue, that this problem is ongoing. There are least five post-Structuralist strands in contemporary linguistics. 1)- First there are the properly called post-structuralists who simply tinkered with the binary relational unit at the heart of classical Structuralism, trying to complexify it by adding a third element, some kind of “differend” that would act as a mediator between the positively marked | and its negatively unmarked Other [ ]. And then there are those who tried to start from scratch, building entirely new ways of looking at language that have nothing to do with Structuralism’s core tenets. 2)- Second there are the analytic philosophers who behave as if Structuralism never took place, continuing to build on the insights of earlier rhetoricians and grammarians. 4)- Fourthly there is Generative Grammar, started by Noam Chomsky, a unique approach to linguistics that has overlaps with 2 and 3. We shall not deal with any of these traditions here, for while neither GR, analytic philosophy, or even later computational linguistics do not clumsily reduce all linguistic structures to iterations of the single relation of binary opposition – a patently absurd proposition ­– like Structuralism, they continue to treat languages as disembodied “virtual” systems, sets of “abstract” rules governing the formation of words, sentences and higher-order linguistic complexes. Below is a simple example of this type of linguistic analysis. 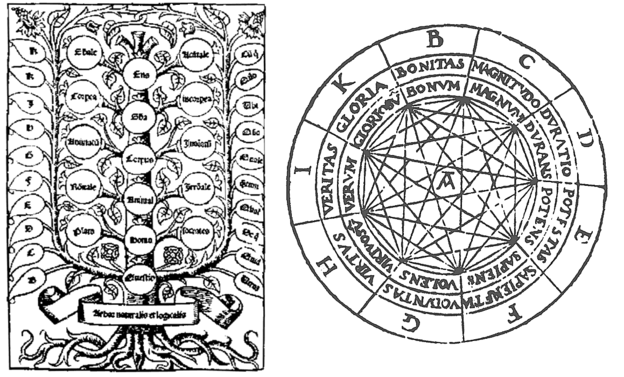 5)- What is required by the writings of the fous is precisely a way of understanding language that includes both a system of social conventions or linguistic laws, and extremely complex arrangements of affects and drives that emerge from individual bodies, or more precisely, individually somatized psyches. In each of their own unique ways, Foucault, Kristeva, Deleuze, and Lucé Irigaray all tried to develop theories of language that could encompass this dyad, a dyad that may more rightly be seen as a triad, including as it necessarily does, not just a social system and an individual body, but also a psyche...Indeed, possibly the greatest challenge in this quest is precisely how to situate "the psyche" within the project, how even to define what such a phenomenon might be. As we shall see, each of the great fous offers different responses to this problem, and perhaps even, different solutions to how to practically live (with) in its materially-significant reality.